It gets interesting when you do start stretching the HUD. That’s when the widescreen property kicks in. While the bounding box of the menuDef or itemDef still gets stretched, the content can be either left, center or right aligned. By entering value 0 or by omitting the property the menuDef (and with it the itemDef) will still stretch as it was in the old situation. 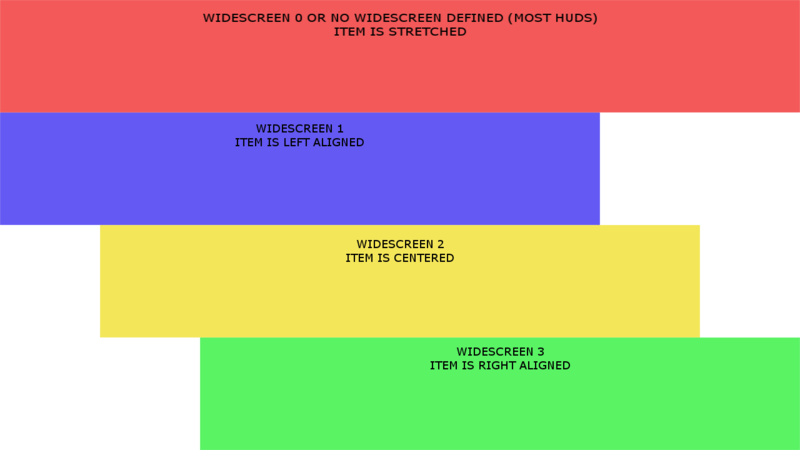 The following image explains what would happen with the above image if we were to stretch the HUD. 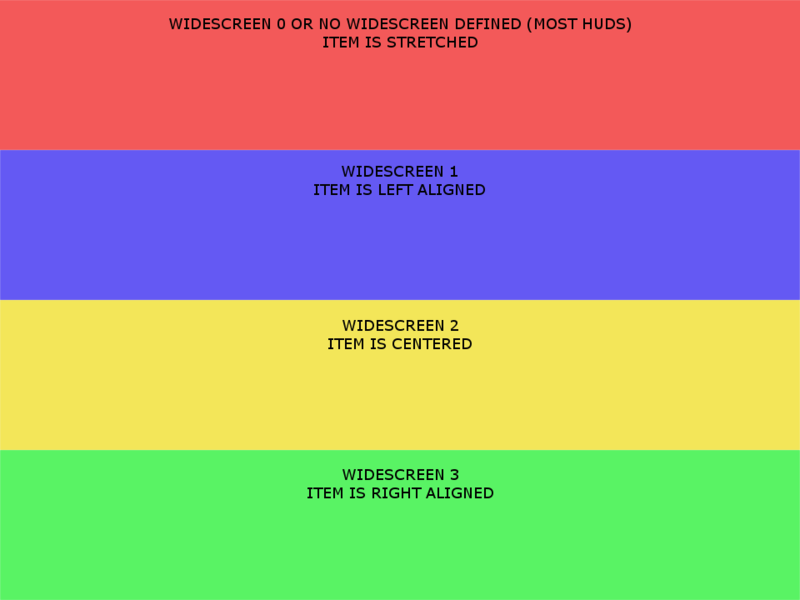 The elements that were defined in the first image get placed where the widescreen property tells them to be placed. Keep in mind that the box that is used to relatively place the HUD element is still being stretched, it’s the content inside the box that does not stretch, but rather “move” inside the box. HUDs are built by defining menuDefs which contain itemDefs. You can either decide to put an entire menuDef in widescreen by defining it once there, and/or you can selectively add the widescreen property to itemDefs if you want specific sub-items to be placed elsewhere. A menuDef is created that represents the entire chat area it’s as wide as the entire screen in a 4:3 ratio (rect 0 301 640 120). When the HUD gets stretched, the entire chat area gets aligned to the left side of the “640 wide” box. Inside the menuDef we have 2 itemDefs which define the gradient background (by loading image ui/assets/hud/chatm.tga) and the actual chat text itself. The gradient and chat are 2 seperate items defined. The chat and gradient align to the left, as you can see. If I wanted the gradient background to be right-aligned, I could add the widescreen parameter to the boxBackground with a value of 3. The result is that the gradient is now aligned to the right side of the ‘”640 box” that got stretched. keeping the item inside properly scaled.